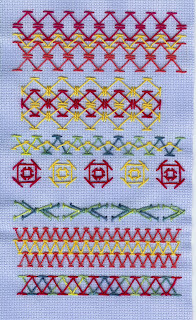 Now this stitch I love! I had great fun working out various combinations and love the different looks of it. It fills the space very quickly and I was able to get into a much more regular stitching rhythm than I managed with the Cretan so that helped. The TAST challenge is proving to be light relief from the main topic on my mind at the moment: fans. I am taking an evening class this year: City and Guilds Creative sketchbooks. It's a very good course but quite intense with quite a lot of work to complete by June. We spent the first term covering different techniques and also having a go at a sample sketchbook (mine was on grids & patches). Now we have to complete a customised sketchbook by mid April and then do a constructed one by June. 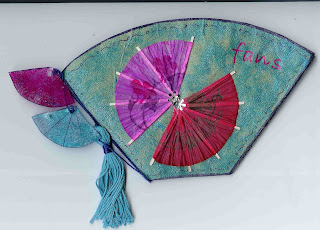 My customised one is on the theme of fans and I see fans everywhere and images and ideas spin round in my mind almost all the time. I've yet to put together anything concrete but ideas for pages are starting to take shape and I've collected quite a few images and samples together. This afternoon has been spent trying to get an overall idea of it and I think progress has been made even though I still have nothing to show for it. The first finished piece is a little fan book which uses coffee filter papers (which come in the shape of a fan!) 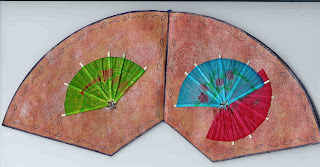 My daughter suggested that the little cocktail umbrellas you can buy at the supermarket look like fans so cut in half they became the main images on the pages. I made a couple of fans out of shrink plastic to hang down the spine with a tassel. The pages are painted with Stewart Gill fabric paints and I had to stick two papers together as they are very absorbent (naturally!). They crinkled a bit so I ironed them and the finished result has quite a fabric feel to it. I think I will make some sort of pocket in the sketchbook to slip the book into.